Scary Villains Of Horror Movies Unmasked!!! Here’s How They Actually Looks… – 3Stoogiez! Are you a fan of scary movies? Well, it is but a crazy thought of having someone there ready to diffuse spooky things just behind your back! Nightmares, fears, this always happens after a trembling horror movie viewing. Monsters, zombies, serial killers, vampires, ghosts, and other prevalent elements more often brings horror to the viewers. Who can ever forget the horrifying image of this demonic nun who brought horror to the Hodgson family? This demon nun was named Valak, the main antagonist of the 2016 horror film, “The Conjuring 2” who is now among the top ten greatest horror sequels. But of course, we give due credit to the face behind this ghostly image in the person of the character actress, Bonnie Aarons who said in playing the role, she had to be evil as she can be. The super-creepy black-haired ghost, Samara of “The Ring” was played by Daveigh Chase. “The Ring” was the Gore Verbinski’s horror movie back in 2002 where Chase was highly recognized with her portrayal. In fact, she won the prestigious “Best Villain Award” in 2003 at the MTV Movie Awards. It’s quiet surprising that behind this eerie makeup was really an angelic face. This original creepy “boy in the lake” who once surprises everyone when he unexpectedly emerges from the chilling icy waters of Crystal Lake was named Jason Voorhees, the young bullied son of the camp cook in the Paramount horror movie “Friday the 13th”. The character was played by Ari Lehman who now, aside from acting became a seasoned recording artist and professional musician with his band named “First Jason”. Pennywise was a dancing clown that is capable of killing every human but then preferred to quest children as a victim as they can be manipulated and scared easily. “It” as this clown was also known, was the main antagonist of the Stephen King’s horror novel, “It”. 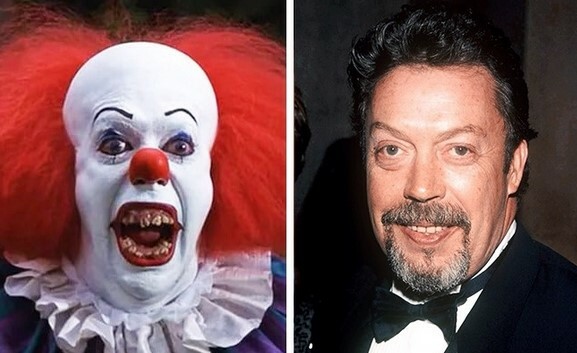 The character was famously played by Tim Curry an English actor, voice actor and also a singer by profession. He is known for portraying villainous roles. Freaky nightmares might had brought you sleepless nights upon the sight of this scary film. He was called Freddy Krueger, the character of infamous serial killer in the horror film series “Nightmare on Elm Street”. The character was exemplary played by Robert Englund who actually received a Saturn Award nomination for Best Supporting Actor for A Nightmare on Elm Street 3: Dream Warriors in 1987 and A Nightmare on Elm Street 4: The Dream Master in 1988. Englund is still doing well on movies and television as well as in music industry. Leatherface is a notorious cannibal killer who puts on a human skin mask in a horror film, “The Texas Chainsaw Massacre: The Beginning”. The character was played by Andrew Bryniarski an American actor and former bodybuilder. His gold was taken from him which urge him to have it back by any means and get revenge to people who are responsible for it. He was called Lubdan, an evil and murderous Leprechaun in the the film “Leprechaun”. Lubdan was perfectly put into characterization by Warwick Davis, which proudly stands 3’5 .Davis is an actor, television presenter, writer, director and producer. Pinhead is a powerful fictional character, being armed with hooks and chains to distort his victim in a 1987 British supernatural body horror film. This violent murderer is highly resistant to gunshots and even futuristic energy weapons. Pinhead character was played by British actor, Doug Bradley.